What's In My Shower? 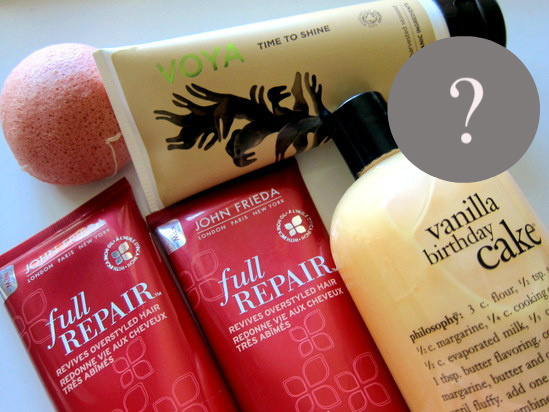 Daily Essentials from Voya, Philosophy, John Frieda, Gillette and more! I've been mixing it up recently when it comes to my morning routine so I thought I'd do a little post to share what's in my shower. First up, Jeward would mightily approve of my current body scrub. I'm using VOYA's Time To Shine - a lovely body buff made with organic, hand harvested seaweed, known for its anti-ageing and collagen boosting properties. Finely ground walnut shells along with flakes of seaweed gently exfoliate while almond oil and ginger extracts give skin an added moisture boost. They make it smell gorgeous, too. You can pick this up for €29.00 for 200ml. On to hair care, and my thick, dry hair is loving this shampoo and conditioner from John Frieda's Full Repair range. They both contain Inca Inchi oil, to nourish overworked hair. Despite the oil, the products feel quite lightweight and don't weigh down my hair. They have a light, pleasant scent and, for convenience, you can't beat a squeezy tube. My one niggle is that the tubes are identical so they're easy to mix up in the shower, especially if you're as dozy as I am in the mornings. You can pick these up for €6.31 each; a deep conditioning treatment is also available, for €7.03. Philosophy's Vanilla Birthday Cake is just divine - it's rich and indulgent, smells like dessert and lathers up a storm. What's not to like?! I've been using it as a shower gel but it can also be used on the hair or in the bath. These 3-in-1 lovelies come in a range of 'flavours', from baked goods to florals to cocktails, each more delicious sounding than the next. At €18 they're definitely in treat territory, but they are massive, versatile and smell amazing, to boot. I also wanted to mention the Gillette Venus ProSkin Sensitive razor which I've been using and loving lately. I was sent this a while back and have been really impressed: there are five blades so it gives a really close shave, but without any irritation - so it's suitable for sensitive skin too. It's apparently dermatologically tested and accredited by the Skin Health Alliance. Pricewise, it comes with one cartridge and a showerpod for €11.59; replacement blades are €11.29 and there's a matching Satin Care Pure & Delicate shaving foam which is priced at €3.99. Last but not least I am still singing the praises of the Konjac Sponge to anyone who'll listen. Made from moisture rich, naturally alkanine plant fibres, this little puff is the business for cleansing and gently exfoliating the face. You can use it alone or team it with your regular cleanser - read more about it here. Have you tried any of this little lot? What's currently making up your morning routine? I love vanilla scented products. Will have to check out the John Frieda hair repair. Where did you find the philosophy? I love their cinnamon buns "flavour" and I've never seen it here - got in the US a couple of times. Also the Voya - very expensive but beautiful smell - again where did you find it? Philosophy is one of the few things that is a lot cheaper over here and I've become addicted. Love this product! Hi Claire, you'll find Philosophy in Arnotts and Voya in various spas or online at www.voya.ie. You can also call them for your closest stockist on 071 9168956 or mail sales@voya.ie. Hope that helps! Did not know philosophy could be found in ireland either just sometimes in tk maxx!! 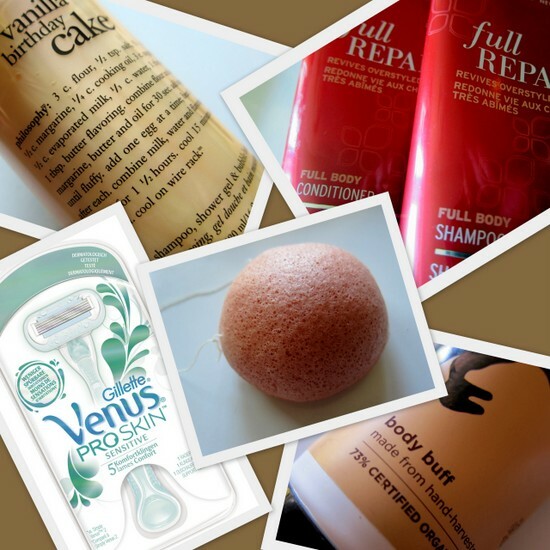 Great idea for a post - like your John Frieda choices and that Vanilla stuff looks yum ! Would love to try the VOYA stuff & also Vanilla Birthday Cake sounds yummy!! vanilla is a great fragrance for every season! Love it! Hope you are having a wonderful day! I have to get me one of those Konjac sponges!! I love seeing what products other people have in their showers! I love John Frieda, I use the Frizz Ease products a lot and love them, also the Root Awakening range too, they smell amazing! Must try out some philosophy stuff soon, heard great things! The Philosophy Birthday Cake sounds incredible!!! I love Vanilla.